The capital of the province of the Los Santos, located fairly close to the Pacific Ocean and is serviced by the seaport of Mensabe. The city was founded in approximately 1671, by Jacinto Barahona. Las Tablas is claimed to be home to one of the best carnival celebrations in Panama – known as Carnival in Azuero. Two streets, the High street and the Low street, attempt to outdo each other with their day and night parades over a 5 day period, enough to rival the carnivals in Rio de Janeiro. The well developed city sports fantastic infrastructure with easy access to all amenities and facilities. 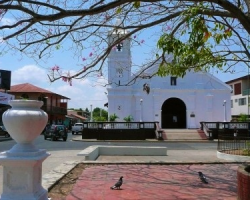 Amazing sights and sounds in Las tablas include the ancient Santa Librada Church, the Museum Belisario Porras and many more. The location of the city makes it ideal for visits to the multitude of beaches within easy driving distance, which cater for all types of water sports, deep sea fishing, scuba diving and general interest and relaxation. The area is optimal for investment opportunities in the surrounding Azuero region, as well as the benefit of the varying climatic conditions available throughout the nearby regions, to suit those more climate sensitive. There are coastal plains as well as mountainous regions within close vicinity of this commercial centre. If you are thinking of investing in Panama Real Estate then Las Tablas is well worth a visit.